Say goodbye to muffin tops and love handles and thigh fat! CoolSculpting is safe, effective and is FDA-cleared to treat the abdomen, flanks, thighs, and most recently, the double chin! Results look natural and can be seen as early as three weeks following treatment, with the most dramatic results after one to three months. Other treatment areas may include arms, bra line. 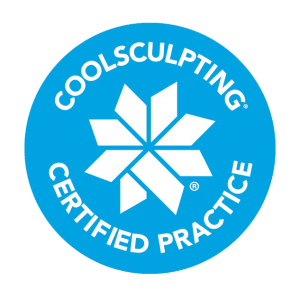 Call us today to schedule your consultation, to find out if CoolSculpting is right for you. Treatment areas may include: abdomen, upper abdomen, love handles, double chin, bra line, inner thighs, and backs of thighs. CoolSculpting noticeably reduces fat in the treated areas, but results may vary. During your complimentary consultation, a treatment plan will be discussed to address your specific needs. During CoolSculpting, the treated fat cells are reduced. As long as you maintain a healthy lifestyle, results can remain for a long duration.